New York's Metropolitan Museum of Art is considering dropping long-time major donors, the Sackler family, after new reporting indicates they were more closely tied to their company's role in the opioid crisis than previously thought. Museums in both the United States and the United Kingdom—including the Met, the Tate, and the Serpentine Galleries—are facing public scrutiny over their continued ties to the Sackler family, the Art Newspaper reported. The family's money—an estimated $14 billion as of 2015—comes from their ownership of Purdue Pharma, the firm responsible for the widely abused prescription opioid OxyContin. The Met is under particular scrutiny because the museum plays host to a "Sackler Wing," given in 1978 by Sackler brothers Arthur, Raymond, and Mortimer, and now home to the iconic Temple of Dendur. 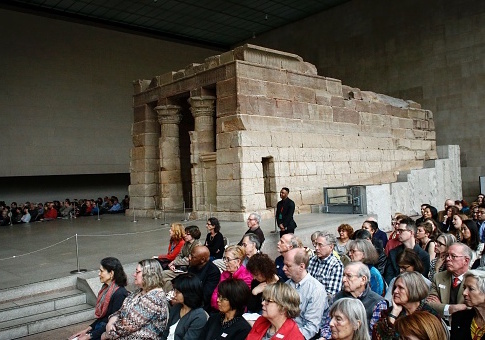 "The Sackler family has been connected with The Met for more than a half century," Daniel Weiss, the Met's president and chief executive, said. "The family is a large extended group and their support of The Met began decades before the opioid crisis. The Met is currently engaging in a further review of our detailed gift acceptance policies, and we will have more to report in due course." In past, Purdue Pharma sought to distance its chief family from the company's role in the opioid crisis. But new information in filings released from a lawsuit by the state of Massachusetts suggests members of the family—especially long-time Purdue president Richard Sackler—actively encouraged aggressive sales tactics now linked to increased prescription opioid overdose deaths (Purdue has denied these allegations). Arthur Sackler's widow, Jillian Sackler, has attempted to distance herself from the unsavory connection, emphasizing that Purdue Pharma is owned by the families of Morton and Raymond, and that Arthur's charitable giving occurred before his death in 1987, a year which also substantially predates the development of OxyContin. Still, that leaves the family of the other two brothers on the hook, including in a $500 million lawsuit brought against them by the City of New York last week. Their possible personal liability in the deaths of tens of thousands of Americans is likely to encourage even more scrutiny of their art patronage going forward. This entry was posted in Culture and tagged New York, Opioids. Bookmark the permalink.